We live for dramatic and immersive audio. Specializing in original sound and music for video games, film, and TV, we dedicate ourselves to providing the highest quality audio product for your project. Client needs are of utmost importance and here at Twin Ravens Audio, we guarantee work that is detailed, on-time, and tailored to fit your unique needs and budget. Call or email us for a quote today. Known for his unique approaches to audio, Stephen Pierce creates memorable experiences through music and sound. Having been trained in music composition and performance at Berklee College of Music, he is constantly searching for new and exciting ways to bring stories to life through music. As a sound designer, he looks to immerse audiences into new worlds through the use of meticulously designed audio. 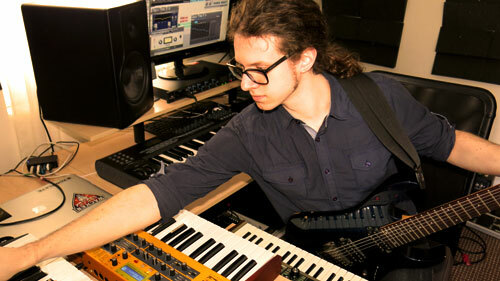 His work can be heard in Harmonix’s Fantasia: Music Evolved, as well as a slew of indie games. Daniel Müller is passionate about immersive audio and strives to find new and unique ways to present it. As a graduate from Berklee College of Music in both Electronic Production & Design and Film Scoring, he specializes in sound design, audio engineering, and electronic music production. Daniel is our resident engineer, responsible for mixing and mastering all audio we produce. His work can be heard in various indie games, films, and albums and his work as a sound designer and engineer earned him the Thomas Dolby Production Award during his time at Berklee. When not working on projects, Daniel is playing bass for the band, Wilderun and is producing electronic music.